Keyword stuffing, deceptive reviews, buying installs from a growing sector of Shuabang companies springing up across China. In a market where some app companies are harnessing these (and other) Black Hat ASO tactics to push their apps up the charts, you need to fight back — and fight smart. But you also need to choose your battles carefully, not squander your already limited resources. In Part 4 of this in-depth 8-part masterclass series built around the insights and advice compiled in our forthcoming VB Insight Practitioner’s Guide we help you to recognize how, when and where app companies are using Black Hat ASO tactics to manipulate algorithms, and how you can counter these tricky attacks with appropriate and effective strategies to get your app noticed (not banned) in the app store. 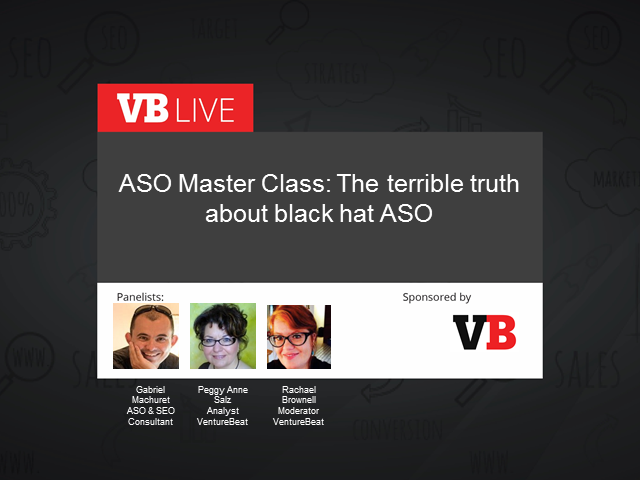 Learn to optimize your app presence in a marketplace transformed by tidal wave of Black Hat ASO practices by attending this VentureBeat webinar with Gabriel Machuret — a world-leading ASO expert and author of the first book on the subject available via Amazon — and Peggy Anne Salz, author of the report. * Understand the "hard truth" around app store search and discovery mechanisms that are working against your app — and in favor of clever competitors. * Learn proven strategies and tactics to help 'bulletproof' your app against attacks. * Ignite your app appeal with the power of human user reviews to battle bots and Black Hat devotees.